Why do we bow in the martial arts? 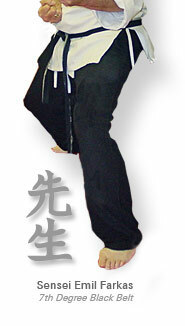 The bow is a traditional gesture of respect used in many of the Oriental martial arts. It is used when addressing an instructor, at the beginning and end of class, when facing off against an opponent or when entering or leaving a martial arts dojo (gym). What is the minimum age for attaining a black belt? Most schools and organizations have different criteria for awarding a black belt. At the Beverly Hills Karate Academy, a child who has reached the age of 10 is eligible for the rank of junior black belt. What are some of the major reasons why people study the martial arts? People study the martial arts for many individual reasons. Some of the principal reasons are self defense, physical fitness, stress relief and as a competitive sport. Can the elderly study martial arts? Martial arts training is individual and one progresses at his or her own pace. It is an activity that people in their 80s can do effectively, as long as they don’t try to compete with the 20-year-olds. Can women who have learned martial arts really defend themselves? Yes, if a woman learns to use her body properly, she can effectively stop an attack. Not only does she have the skills, she also has the element of surprise. Few attackers expect a helpless woman to be able to fight back effectively. Will my child be hurt in a karate class? Absolutely not. Karate classes are highly disciplined and students are taught to pull punches and kicks before contact is made. In over 40 years no injury has ever occurred at the Beverly Hills Karate Academy. How do you choose a karate school? Always watch a few classes to see if you like the instructor. from training. Check out a school’s reputation in the community. The longer a school has been in operation, the better chance it will be a good school. Compare prices. A school that is very overpriced is not always better than the school with less expensive rates. Decide what you are looking for: traditional karate, self-defense or competition. Join the school that best meets your need. Beware of signing long contracts, because you may want to leave and will be liable for a huge payment. Is karate good for little girls? Little girls become big girls and nothing will make you feel better than knowing your daughter can walk the streets safely and defend herself when necessary. Karate originated in Okinawa and was eventually introduced to Japan by Gichin Funakoshi in the early 1900s. During the 1950s karate was introduced outside Asia by top ranking Japanese instructors. Today millions of people study karate worldwide. What are some of the major benefits one derives from karate training? Besides self-defense skills, a karate student develops self-confidence, self-esteem, humility, courtesy and respect for others. It will also get you in superb shape. Why choose the Beverly Hills Karate Academy? The Beverly Hills Karate Academy has been in the same location for over 40 years and has thousands of satisfied students. The Beverly Hills Karate Academy is run by Emil Farkas who is not only a highly ranked martial artist but a highly respected instructor who loves to teach and impart his knowledge to everyone, especially children. Will karate get someone in shape? Karate training is great for the three main areas of fitness: strength training, aerobic training and flexibility. Will karate training make my child aggressive? No. We teach all children that karate is to be used only in self-defense situations. Children are taught respect for each other, for friends and for family. As a matter of fact, karate training channels children’s aggressiveness so they can kick and punch the bag instead of each other. What is the best age to begin children to train in karate? Children as young as four can begin to benefit greatly from training. If a child can follow directions, he or she is ready to train. Every child, of course, is different but four or five is a good age to begin. How long will it take to get a black belt in karate? Earning a black belt will depend on many factors, such as how often you train, how old you are when you start, what kind of shape it you are in, how athletic you are, etc. Getting a black belt in karate usually requires about four to five years of training. What are the belt colors in karate? At the Beverly Hills Karate Academy all students begin with white belts. The belt progression is yellow, orange, blue, purple, green, brown and black. How does Shotokan karate differ from other karate styles? Shotokan karate emphasizes strong punching, kicking and striking techniques from a foundation of solid stances. Most of its techniques are linear with emphasis on full body motion. Many other karate styles are more circular and less powerful, with less emphasis on quick solid attacking and defending techniques.